Arainaz is a Khajiit servant in Rellenthil on Summerset. 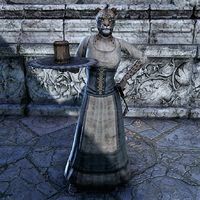 You can find her on the terraces southwest of the Manor of Masques serving a mug of ale to the patrons gathered there. She cannot be spoken to.